Epworth Sports + Exercise Medicine Group > News > News > Sports Physicians Dr Andrew Daff and Dr Greg Hickey holding the 2017 AFL grand final cup. 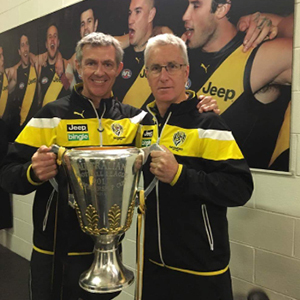 Working at Richmond Football club for the last two years, Sports Physician Dr Andrew Daff and Dr Greg Hickey participated in their first AFL wining grand final as club doctors. Pictured here, they share the celebrations, holding the famous AFL Premiership cup. Dr Andrew Daff has been partner in the Epworth Sports and Exercise Medicine Group since opening in 2008. Before joining the Tigers he was a club doctor at the Melbourne Football club for 20 years. Dr Greg Hickey currently at Victoria Institute of sport was the doctor for Melbourne Storm team when they won their first premiership in 1999 and was the doctor with Richmond reserves team which won the premiership in 1997.